Lucia is a truly rural digital journalist. She had access to a privileged education in one of the top Guatemalan Schools and she was working in a prestigious newspaper. However, almost a decade ago she decide to quit and move to a beautiful but highly unequal and complex region in the country, Panajachel. From her house in Panajachel she combines teaching with a variety of activities and her labor as mother of two boys. She started Movimiento Ati http://www.radioati.com/ a digital radio which combines a variety of activities, from a printed magazine to cultural and art festivals. She is tirelessly trying to promote education, access to culture and awareness on environmental issues. She also publishes on her blog and two of the most important newspapers, opinion on local issues. 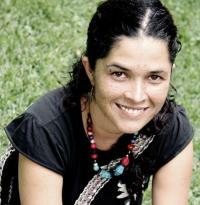 On October 19, she published an article http://lasotrasluchas.blogspot.com/2011/10/de-cuervos-ojos-y-demonios.html about the increase of violence in the area, from lynching to social cleansing and death squads torturing and disappearing people they dislike. Those accused on her article as promoters and architects of such repressive, lawless system where the members of the local Citizen Security Commission. After the publication of the article, the Citizen Security Commission during the broadcast of their meeting, accused the journalist of drug dealer and consumer, called her rubbish and suggested that she should end up in a dump, furthermore, they sent messages with locals warning her to be quiet if she do not want to end up dead in the bottom of the lake.